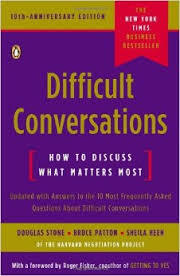 Humans attempt to avoid difficult conversations. Period. But we don’t have to live that way! I am grateful to a friends recommendation of this book. Doug and I were going through a difficult patch in our communication and had some deeply-grooved conversational patterns going on that were confusing at best and often hurtful. The book gave me insight on how to change that. Cheap marriage counseling for sure! The book is based on fifteen years of research at the Harvard Negotiation Project which I found reassuring. It walks you through a step-by-step proven approach to having your toughest conversations with less stress and more success.